*These are limited to 10 coins per household. The Chinese year 4715 (Year of the Rooster) starts on 28th January, 2017. 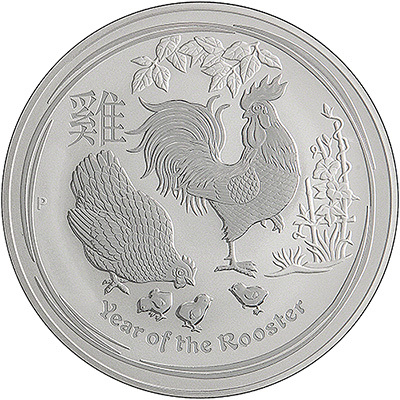 The rooster is the 10th of 12 animals in the Chinese lunar calendar. Those born during the Year of the Rooster are thought to be hardworking, observant, confident and honest. The reverse was designed by Tom Baughan and features the male cockerel in his full glory with his hen and three chicks and tufts of grass. 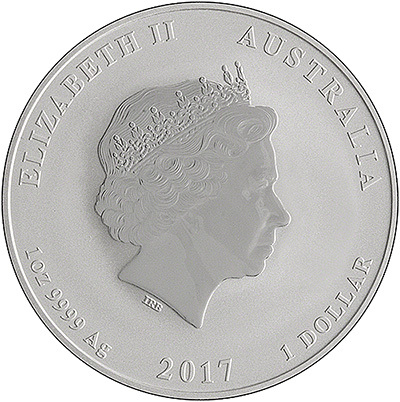 The obverse shows the Ian Rank-Broadley portrait of Queen Elizabeth II. The one ounce coins have a limited mintage of just 300,000, meaning once we've sold out of our allocation we cannot order any more. We have found the one ounce version to be the most popular out of all the sizes produced. The rest of the sizes are produced on a "mint-to-order" basis. We will have the 2017 Australian Silver Kookaburras in stock. We will have the year 2017 Australian Silver Koalas in stock. We will have the year 2017 Australian Silver Kangaroos in stock.